Do you work for Duolingo? Learning with Duolingo is fun and addictive. Earn points for correct answers, race against the clock, and level up. Duolingo's bite-sized lessons are effective, and we have a study to prove it. "Good app but needs a lot of improvement." I like that I can assign exercises to my students and they can type and learn spanish. The exercises are very easy to do and some students really enjoy the interface. That many times it has bugs or it appears that the students did an assignment but they did not really do it. I mean, it appears like they have finished doing something when they did not do it at all. I wrote my problem and tried to contact their manager or the people in charge and there is no phone number and I can only ask the question in a forum. Some other people told me to send a screenshot of the problem to an email but it is very difficult to do and how are they going to know which student has the problem and which student dont? It is very frustrating. Students learn vocabulary and sentence making with Duolingo. They learn more and better. I can use it very well and I assign different topics according to what we are learning. "Learn by having fun "
For the first time I find an effective and pleasant method to learn English and French.. Knowing other languages contributes positively in my business relationships, in my professional and academic development. At the same time I develop more fluently my reading, writing and oral expression skills in my mother tongue. Since I opened my Duolingo account, since I have a secion of my own, I have real control over my educational advances in the idiosyncrasies I am learning. Duolingo allows learning at any time of the day, from the computer, the tablet and the smart phone. There are also discussion forums in which it is possible to interact with other people and clarify doubts about the language that is being studied. In summary, Duolingo is the best platform to learn languages in a pleasant way, without pressure, with the help of a large network of users, and without the frustrations of the traditional educational system. I have nothing negative to say. Duolingo is excellent for learning other languages such as French and Portuguese. I always recommend Duolingo to learn other languages. to my friends, co-workers, clients and students. I have improved greatly in reading and writing English, which is very necessary in business relationships and academic improvement. I have been able to access the French language, which is attractive but of little use in the commercial world. Learning other languages helps me enormously to improve and expand my abilities in my native language in Spanish. "a very simple, entertaining and efficient language learning software"
it mainly focuses on the vocabulary and pronunciation but it neglects a little the grammar aspect and the formation of long sentences which is very important. If you want to start a new language from scratch or if you're a beginner in a new language this is the perfect software for you. "Fun, quick, and low cost tool for professionals who work with multilingual clients"
The product is free and easily accessible on Android or Apple products. We deploy it automatically for all 200 of our employees at a non-profit mental health agency, since many of our clients and families of clients speak different languages. It is a perfect tool for clinicians to practice their language skills in their free time and time between appointments, that makes them better able to connect with their clients and families. There is not much to dislike. You can use the free or slightly more extensive paid version. There are a few languages not included on the app yet, but most meet our needs. It would be helpful if Aromo language were on the app, but that is because we work with a unique niche population in the U.S. I would recommend trying out the free version first, before deploying the tiered model which requires some investment depending on the size of your company. That being said, implementation, both time and money wise, is a low commitment so you might as well give it a try. It is a low cost, low impact way, to help clinicians at our agency further their language skills, to better connect with multilingual clients. It is a nice addition that they can choose to use when they have the time, but is not as intense as full time classes. It can be ad hoc, and virtually free, professional development. Since we provide community based mental health services, having clinicians able to speak other languages helps them connect better culturally, emotionally, and logistically with clients (kids) and their families. It is not uncommon that we have families that do not speak any English, so having tools like Duolingo can help us connect with them better and decrease or need for interpreter services (saving money and administrative time). "Buena experiencia, aún se puede mejorar." 5. Mejoras en las lecciones, recordatorios básicos que antes no habían. 7. Opción de exonerarse de las lecciones. 8. Practicas traduciendo artículos dentro de Duolingo. 9. Certificación de inglés, la cual es aceptada por diferentes instituciones y organizaciones. 1. Aún presenta algunos problemas con las traducciones básicas de inglés a español. 2. Las unidades extras les falta pulir en la traducción de inglés a español. 5. Hay algunos problemas con el audio, muchas veces no se entiende bien. 6. Debido a su diseño y formato, puede llegar a aburrir rápido. 7. El costo del certificado final; muchas persona usan Duolingo por ser gratuito, y cuando llegan al punto del certificado final y que tiene valor, decepciona mucho. Es una plataforma útil para aprender nuevos idiomas, sea por necesidad o por diversión. Es práctico, fácil de usar, online y gratuito y te permite tomar un test final para acreditar lo aprendido. Estamos aprendiendo nuevos idiomas en la institución. Seguimos en la búsqueda de la herramienta óptima para nuestro tiempo libre durante el trabajo, Duolingo no fue la primera opción, pero debido a la facilidad de uso, aún la usamos y nos ha traído resultados. "A fantastic tool for learning languages"
Duolingo is a fantastic resources for people who are currently learning and language and need a tool to revise, those who have learnt a language in the past and do not wish to forget their skills, or even those who want to pick up a new language. The course content is easy to process and fun to work through, and the daily reminders and steak system ensure that the learner can stay engaged and not forget to complete some language learning each day. While Duolingo has excellent support for a wide range of languages, there are still some languages which have not made their way into the online curriculum. While this is understandable for a free and extremely well developed tool, it does restrict the audience Duolingo can be used by and recommended to. Additionally, while Duolingo's course content is very well structured and organized, it is not as perfect as a specific revision tool, as it lacks the functionality to specify a certain topic or group of words to revise. If you are in the process of learning a language, Duolingo is an invaluable tool. Completing or strengthening a few tasks daily can have an enormously beneficial impact on a language learning experience. When learning a language, only so much can be learnt in the classroom. It is the time outside of the classroom which is crucial to memorising and immersing oneself with the language they are learning. Duolingo is an extremely valuable tool in this regard, as its easy-to-use and friendly interface make using the product and fun and enriching experience. The streak system with its daily reminders provide an effective means of staying engaged with the product. "Improved English and learned Esperanto"
Easy to use and the lessons are organized in chapters. For specific languages to others there aren't a lot of courses and this is a big problem of keep using this application if you want more. "502 Day streak! I love Duolingo, I learn French there, I am now learning German, Portuguese, Italian"
I love the Daily Goal, the day streak, ant the variety of exercise that has Duolingo. It is a complete, free, utopic system, the mobile app is incredibly fast and just weighs 16MB in my mobile if that is not awesome I don't know what it is. I use this app every day of my life since 502 days ago. My dream is to be able to develop an idea application, that be very useful, that people love to use if I can't to that I would like to work on Duolingo. I am studying every day to be capable and acceptable of working with them or developing a good idea. Nothing. I can't say anything wrong about Duolingo, I am very sorry. *if a skill is abstract or costs you to learn, give the skill a week, over that week practice it and practice it until you can do the time practice with 2 minutes of remaining time. *Read and listen Podcasts, Videos, and talk to yourself, it doesn't matter if at the first time goes with a wrong accent. *Find other people who like and love to practice a language. I want to be able to communicate with people who don't speak my native language. I can know listen, take courses, be able to ask about coding problems in slack or other comunities. What I like most is to being able to pick it up and learn anywhere, anytime and for free! It is also entertaining and progressive, which motivates me to keep on track with the path they give and to not give up easily. With Duolingo's methodology it's possible to learn in an almost seamlessly way. I wouldn't say I dislike it, but I believe it helps more as a starter guide to learn than a complete platform to master a new language. Actually, it is even a good point for me now, as it can be coordinated with other activities (together or consecutively). It doesn't require more effort than you can make in a daily routine. I haven't applied my knowledge on business or studies, but it has been nice to be able to understand some words and try brief introductions. I intend to use it as a starting point to learn a new language, as it is easy to conciliate with the daily routine and provides a progressive knowledge. I love the lesson structure -- it is short enough that it doesn't take much time, and tests your language ability from multiple different angles. No overarching grammar syntax is given. Sometimes it takes me a while to learn concepts because of that. A short introduction to new grammar principles would be nice. Also, if I am retaking a previously passed "lesson", to refresh my skills, sometimes it gives you the same sentence over and over again just in a different way. While this may be beneficial if you are just learning a lesson, when I am relearning a lesson I tend to remember the sentence, instead of trying to understand the words that make up the sentence. Also, more lessons that focus on understanding what you hear would be helpful. For me that is much more difficult than understanding the written word.. I haven't really used this in a business setting yet. "Decent gamification of language learning." Decent variety of languages. Good progress tracking and practice reminder system. Good repetition structure for maintaining vocabulary. I like how the lessons adapt to my failures. I like the ability to switch between languages to keep my mind alert. And I like the brevity of each section so that I'm able to sneak in a lesson during a busy day. Wish there were more languages available outside Europe. The Android app doesn't have the same tops and basic learning text as the website. These tips are helpful and not wordy enough to prevent including in the app. Voice Recognition not as good on the app (too forgiving) and sometimes I wonder if it's even checking. Also, sharing certain achievements from the app would be nice. The app is far more convenient than the website, which is why I primarily use it. Also, the service can, at times, stop responding and this can become frustrating when you have to bail out of a lesson that is nearly complete because the service can no longer grade. It is also stunting when you are on a roll and suddenly have to wait for the grading to complete. It would be nice to be able to have the option of locally caching progress on a particular lesson in the event the grading cannot complete. UPDATE: Recent app update greatly improved. Very pleased with this version though I do still wish the tips were present from the web app. Don't be afraid to switch to another language if you start getting tired of the one you're working on. Context switching can help prepare you for encounters when your mind has to suddenly switch gears and start communicating in an alternate language. Opening up opportunities to work with international clients, though, the language options are for countries where most of the population also speaks English. The only benefits for me so far are personal. I gain new perspectives on language by learning those that I am unfamiliar with. "Great tool to learn a new language"
For me, what makes Duolingo so interesting is that the learning method is both progressive and entertaining. We start with the very basics, words we might use in daily life, and the variety of exercises combined with the friendly user interface makes it fun. Finally, being able to follow my friends and what they are currently learning makes me know a little more about them. My main critic would be towards the maximum level you can reach with the software. Once you get to intermediate level, with complex sentences, it becomes quite hard to get the right answer, as all the possible right answers are not taken into account. Therefore, it is necessary to think about the litteral meaning of each word, whereas in the real life the meaning could have been totally different, or you just don't say it like that. The problems I am facing in the business environment are mostly about communication and processes. Communication, as I am to promote my solutions within the company, and processes, as they must be very clear in order to convince as many people as possible. The duolingo solution helps me to keep up my language skills, in order to create connections with foreign interlocutors. "A great way to start learning a language." I like that the program gives you plenty of help while learning new words. It doesn't leave you hanging if you forget some words you learned previously, it will guide you through so you don't become frustrated and give up. I think some of the lessons are too short for some of the more complex vocabulary and sentences. The lesson lengths are perfect for learning the basics. Once you get into more complicated subjects, like past or future tenses, I don't think you are able to spend enough time learning the new words. By the time the lesson is over you've only seen the new words in two to three sentences. Duolingo will not provide you with all of the tools to master a language. It's a stepping stone to allow you to begin using the language in your day to day life and build upon your knowledge by interacting with others. I work in construction management, so learning Spanish has been very beneficial for me. I'm not able to fully converse with people yet, but I am able to understand what people are talking about or what they are asking for. It's very beneficial for me, because people gain a lot more respect for you when they realize you've put forth the effort to understand their language. "Fantastic way to learn a new language at any pace "
Duolingo lets you work at your own pace and offers a wide variety of languages. I've always wanted to learn Spanish, brush up on French, and try some other languages like German. This allows me to learn in a useful and meaningful way, with feedback for reading, writing, listening and speech. I love that it monitors your "streak" of days you've used the app, and feel genuinely motivated to keep using it every day. I have convinced several other friends to join me as well and everyone who had a moderate to deep interest in learning a language has gotten a lot out of it. This is an app that actually teaches me something useful that I have never made time or set aside money to do, but have always wanted to learn. The only complaints I have ever had have been with regard to the calculation of points for daily lessons, and have not involved the content of the app. In the current version of this app, I have no such complaints. I'm learning new languages and increasing my comfort level with a language I studied extensively in the past. This allows me at least a basic comprehension of documents I encounter personally or professionally that are in other languages, for identification purposes and more. I look forward to getting better at these languages and adding more, and pursuing fluency which would open many doors for me professionally for contract review. "The best way to learn a new language in a fun and challenging way"
My favorite part about Duolingo is the ability to pick it up anywhere. The hardest part about learning a language is finding the time to sit down and study a subject as difficult as a new language. Duolingo makes it easy to study a language in short burst lessons in your downtime; even if that is only five minutes. It is hard to find something to complain about with Duolingo. The only gripe I have with Duolingo is that is focusses too heavily on simply translating text from language 'a' to language 'b'. My speaking skills haven't improved nearly as much as my translating skills. I also feel like I'm only learning a very specific set of phrases. Duolingo doesn't provide a robust way to communicate with other users outside of discussing sentences. Improving the speaking functionality would greatly improve my ability to utilize the language in my daily life. While I haven't used my second language in any business sense, I can see how it certainly opens new doors that wouldn't have existed prior to Duolingo. The benefits are being able to communicate with an entirely new group of people as well as a whole new array of jobs I wouldn't have bee about to apply for otherwise. "Great way of learning the basics of a language"
The short sessions that you can take in some lost time. Also that a session cannot fail. They used to work with hearts. After 3 mistakes you'd have to start over. They switched this to a system where you need 20 correct answers. Any wrong answers are deducted from this total. This puts a certain limit on the time to complete a lesson. Ideal for doing these during your morning commute. It unfortunate that the app doesn't connect you with other people that are also trying to learn the same language or the opposite one. Because i feel i don't get enough experience in talking the language. Because you don't really feel the need to use the language, it seems the learning speed suffers. Try to do one lesson every day. They keep a steak of consecutive days you practice. Although they don't save your record, it can be a big motivator once you get a streak up to a few hindered days. It almost becomes a must do, to make sure you don't miss your exercise. I was pretty bummed out when i lost my 300 day streak. Just a few months ago i lost my 100 day streak again. But i always seem to start using it again after a few weeks of down time. I'm studying Italian as a personal interest. This allows me to speak a few words with my Italian friend or with some friends. Speaking Italian always comes across as cool, since the language has such a nice pronunciations. "Best for people who don't want to waste time." I love Duolingo. I've learned languages at the college level, and tried to learn them on my own, and this is the best way I've ever run across. It's convenient because you can do it anywhere, though the online version is far better than the mobile app. The games make it fun, and they also allow the level of repetition you need to really drive home the grammar and basic vocabulary. Also, it's completely self-paced, so you can learn on your own. The translation of articles lets you expand your vocabulary while helping other people access the internet. I like this program so much, I could be a salesperson. The recording and voice-recognition doesn't work very well. It works better in a quiet room with a good microphone, but eve that is so sketchy that I usually turn it off. Duolingo itself will not teach you how to speak a language fluently. You still need practice with native speakers. However, it's a great foundation. I would recommend this over a college course to get a basic foundation in grammar and vocabulary. Absolutely pair it with a foreign exchange or other immersion and/or conversation practice, as those areas are lacking. I wanted to learn Spanish because I like learning languages and my Spanish was kind of weak. I was really impressed by how solid a foundation I got in just one year. I found a year of daily practice to be equal to or better than many college courses. "Excellent tool for learning a new language!" I like that this app is free to use and offers a variety of material for every language. It can be utilized on the user's time, which is very valuable. It also encourages visual learning. The layout, too, is intuitive and natural in progression. What I have found useful the most, though, is the app's ability to teach language as pragmatically as possible; I can actually hold a conversation with a native speaker of the language I am learning. The speaking part of Duolingo is rather limited. I find that this is the most important part of learning a language. Currently, the speech recognition software has a lot of trouble understand what I am saying. I also dislike the fact that the mobile app and the web app do not seem to sync properly. I would like to have the same functionality on the mobile app that the web app has. Languages are also very fluid. I would like the translations of sentences to be more fluid than they are right now. It is a very good starting place to learn a language from scratch. For a free service, it is incredibly well made and very easy to use. I would recommend using the microphone function to also get some speaking practice. If you're looking for a practical way to learn a bit of a language since you're traveling, this is definitely the app for you. I am utilizing Duolingo in order to read German text for research purposes for a collaborative fictional novel. So far, it has really helped me become more intuitive about German words in English or distinguishing root words. The fact that English is 70% German is, in fact, very true. "Excellent resource for language acquisition"
A friend recommended Duolingo right at a time when I was desperate to begin a determined foray into the German language. It was (and is!) precisely what I needed. Registering was easy, setting up a 'daily goal' was a piece of cake, and here I am (still!) in hot pursuit of fluency. My goal is to eventually relocate and work in Germany, and I feel as though Duolingo is providing me with the precise level of immersion I'd get from taking a college course, without the exorbitant fee! In all honesty, there's nothing I don't like about Duolingo. If I had a complaint, it would be that the android app crashes, but that might be my device and happening through no fault of Duolingo. I wouldn't want Duolingo's creators to be held responsible for a problem occurring on my end, even if I haven't found a resolution yet. If you want to learn a new language, register at once! You won't be disappointed! A major staple involved in moving overseas involves gaining fluency in the native language of one's country of choice. As I plan to immigrate to Germany, speaking fluent Deutsch is absolutely imperative. I believe Duolingo is helping me achieve this goal, and for free at that! I simply cannot see a downside in all this. I'm incredibly grateful to the friend who introduced me to this site. It's changed my life, as it's making my 'dreams' that much more of a reality. "Easy to learn, but you have to stick with it"
Duolingo is a great mix of "holding your had" as you learn and "throwing you to the wolves." You're going to make mistakes as concepts are thrown at you and you're constantly tested, but when combined with the repetitive nature of the lessons, it's really effective. I also really like the business model of the site -- it teaches us new languages for free, and in return users build their way up to where they are translating documents for people who hire Duolingo to get them translated. It's a win-win for everyone. You really do have to stick with it and re-take lessons now and again before you can really consider yourself proficient; it's easy to forget details like the fact that all nouns are capitalized in German if you do a few lessons and then back away for a while before taking more. I'd also like to see more languages. I've always wanted to learn Japanese, but it's not available on Duolingo. I would definitely recommend giving it a try. The initial time commitment isn't much, and even if you have your employees taking one lesson per day, you aren't losing much productivity time. Some employees may enjoy it enough that they will take extra lessons during their down time. While I have a long way to go before I can consider myself fluent in German, I am able to pick up a lot more than I used to -- not only in German, either. Using some of the same methods in my head as Duolingo teaches me when I'm on the site, it's easier to pick up context clues when I hear people speaking other languages. "Great for a free product, but lacking in some important areas." I think the reward system is good. I feel the way the lessons are broken up and the use of game-like achievements and daily goals encourages repetitive use. The introduction of 'testing out' to complete a section your are confident in saves unnecessary frustration. The format of the lessons, ie. matching pictures, listening, translating, selecting the right word etc. worked well for me. The ability to see my facebook friends' scores would also be a good motivator, but none were doing it at the same time. I feel like having completed the whole Spanish course, my actual usable everyday Spanish was still quite limited. I feel like the introduction of new grammar should included more detailed explanations of usage. I felt the vocabulary was limited and sometimes badly chosen. I was repeatedly revising certain words which I would have very little practical use for. In general, my biggest issue was the lack of practical every day language, which a beginner would actually find use for. The 'strength' bars are a good idea, but didn't seem to accurately reflect how i confident I felt about each section. In 'tap the pairs' sometimes the translations could have been more specific. eg. 'dijo' could better be translated as 'I tell' than just 'tell'. On the whole I felt duolingo was best used as a practice tool, rather than a solid introduction to the language. I would recommend duolingo as a tool to assist in becoming familiar with a language used in conjunction with other, more comprehensive sources. I am currently looking for work in spain and using duolingo to improve my spanish. I came to duolingo.com after having done Rosetta Stone for Spanish and Transparent Language for both Spanish and Portuguese. One advantage DuoLingo has over these two is the price: It is free. Rosetta Stone is expensive for what you get; I will defer writing more about that because this is about RS. Transparent Language is reasonably priced and is similar in philosophy as far as it goes. Duolingo is FREE (as of this writing) and goes farther. Duolingo has done a much better job of making the experience game like. It provides excellent incentives to practice every day. It is excellent, attractive software. I don't like the translation aspect. Quite frankly, it is not well-incentivized within the point structure they have established. I set a goal of getting a certain number of points a day and it is much more difficult to do it within the time constraints I have if I spend my time translating. I am learning travel Spanish/Portuguese to help with my univeristy work. I think Duo Lingo is great. I love that it allows for practicing on come computers and mobile devices. It has so many languages to choose from! Plus the XP system keeps me coming back, even after I've put it down for a while. I'd tweak it in a few small ways: First, the mobile app doesn't always accurately reflect the amount I've practiced a particular language module. I figure this is a bug that will get fixed with an eventual software update. My one major concern is the seeming lack of good review material for past language modules. I don't feel I'm as solid on words and grammar as I could be before Duo Lingo moves me ahead to the next thing. Also, I wish it did a better job of recombining past material in different ways for review and study purposes. It could do better at combining past material with new stuff too. But maybe these are things that happen later in the program? I'm not all that far along. Duo Lingo is a fun and easy language learning method. The price is right because it's free! I've learned more through Duo Lingo than with my attempts with Rosetta Stones, language-learning recordings, or even the 2 years of French I took in high school. If you want to learn a 2nd (or 3rd, 4th, or 5th), Duo Lingo is a great way to go. I'm a professional musician with aspirations of touring internationally. I've already had multiple French speakers contact me about interviews and performance opportunities. Knowing even a little French has helped me a great deal with communicating in these situations. "A great start to language learning"
The ease of use, competition with friends and how fast you are able to understand your target language. The game aspect is fun and I especially love the timed practice which adds to your point total very quickly if you know the answers. The forum is great too for chatting with other people using Duolingo to hear other perspectives and get tips. The app makes language learning anywhere a snap. I love being able to use it for a few lessons while i'm on a plane without internet access. It would be great if it had a better testing process and or separate exercises with more in depth explanation regarding conjugation of verbs. The support options could be better as it seems to take a long time to answers. If you want to get a quick start at learning a new language, Duolingo is for you. While it will not go into in depth explanations of grammar, sentence structure, etc., if you successfully finish your learning tree, you will have a great base from which to jump into a more formal language learning process. I chat with Brazilians on a daily basis and can understand a majority of what they say, even if I don't know every word. Duolingo will have you conversing in and understanding your target language fast! I have not had to solve any business problems yet but learning Portuguese does give me the opportunity to have short chats with Brazilian clients. 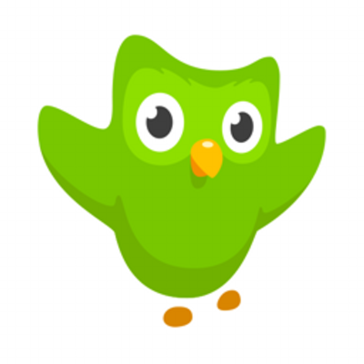 "Duolingo - a solid resource for vocab building and practice. " The ease of access, zero cost, and the design being based around small chunks make it easy to fit in to one's schedule and eliminate most of the barriers that similar, paid products suffer from. This is a fantastic way to practice a couple thousand words in your target language on the cheap, however there are some caveats. Some translations in the younger courses can be a bit strange and sometimes unforgiving until the course designers get around to incoporating feedback. However, my biggiest issue with the program is that in most cases in my personal experience, unless you have outside help in the form of a native speaker or materials with native pronounciation BEFORE starting the process or regular access to a similar resource while just beginning the process, your accent will likely be very bad. It's a failing of the design overall and not much can be done, however I do recommend to all people that use Duolingo - start by learning the sounds and the pronounciation before even starting your target language in Duolingo. Make sure you have access to recordings of nativa speakers (or an actual native speaker) and nail the pronounciation of your target language BEFORE starting Duolingo. As I learned when starting Dutch on Duolingo, it can impart very bad pronunciation habits. Ease of communication between different theaters in our global company, as well as ease of communication with customers who don't have a solid command of English. "How Much I love Duolingo"
I wish it had more listening features that didn't require a response. I recommended Duolingo to someone close to me who had to learn a new language for their job. In a way their job depended on it. After several attempts to learn a new language with other products I suggested Duolingo and they gained more skills in that new language than other programs. I would share this personal experience to anyone considering Duolingo as proof that me and the person I recommended it to highly recommend it to others as well. The benefits of Duolingo don't apply to my career specifically. However learning a language is still a form of education. I think by learning a language you strengthen your memory skills, a skill we can all benefit from. "Helpful for Novices, No Replacement for Immersion or a Class"
The variety of languages available ensures that you will likely find a language you want/have to learn. The simplicity of the site and the app ensure that you will be able to learn at least the fundamentals of a language in your spare time. The website offers an impressive variety of languages. At the time of this review, there are eleven languages that are out of beta, two still in beta, and ten languages in active development. That's just for native English speakers! In addition to brief lessons that feature a mixture of vocal and written lessons, Duolingo features a remarkably innovative system where aspiring multilinguists can spend time translating works in order to gain a stronger grasp of their language of choice. The material consists largely of be online articles that touch on a variety of subjects, thus ensuring that the content to be translated will appeal to someone. Moreover, since this practice doubles as a business model, the website has a clean, simple interface bereft of ads or fees(there is an on-website currency called "lingots," but those are earned through achievements, not through exchange of actual money). In addition to the very reliable and functional website is an app available for Apple, Android, and (all three) Windows Phone users! The app is somewhat more minimalist, but is also very efficiently designed, and even has limited offline functionality. Duolingo is not without flaws. The website, in an effort to serve as many people as possible, is largely server-controlled. While there is a very active community, there are no personal lessons and very few actual people involved. As such, the speech lessons use voice recognition that is... inconsistent at best. When translating a sentence, Duolingo is not always capable of capturing nuance, and as such will sometimes mark right answers wrong and wrong answers as "right enough." The translation portion is, seemingly, all web content, and mostly articles. As such, there is no translating actual recordings, nor published works. When translating, it only offers the option to translate from a foreign language into your native one, and not vice-versa. In order to do that, you must change your native language setting and then sign up to "learn" your actual native language. e.g. If I am learning Dutch, and want to try my hand at translating an article only available in English INTO Dutch, I have to tell Duolingo that my native language is Dutch and I'd like to learn English. The app, while functional, is very limited in scope. You cannot do translations through it as of right now, the lessons are more abbreviated, the speaking exercises obviously rely on server functionality and thus require you to be online. The offline functionality only allows you to practice unlearned lessons, you cannot get a random assortment of exercises or download an old lesson you'd like to go over. Ultimately, Duolingo is no replacement for an actual teacher. This is, at best, going to teach you a language up to the equivalent of a 200 level college class. Be sure to supplement your education. Watch videos in the language, possibly sign up online with some service that allows you to practice communicating with a native speaker. Duolingo will NOT teach you everything you need to know, but is always a useful tool. Learning another language was, frankly, more of a personal pursuit than a business-related one. Hopefully it will prove of greater use in the future. "Great app to keep up your French"
The app uses incentives to keep you interested in practicing. It sends reminders and keeps changing question formats so you don't get bored. It's also colorful, easy to use and includes an immersion option for high-level translation. You can "earn" lingots (language currency) to "buy" fun add-ons to your account. Make wagers against your consistent practice to increase your stack of lingots. Streaks of practice earns you more lingots as well. The app also tracks how fluent you are in the language of your choice. It is a program best suited for people already familiar with the basics of a language. It doesn't teach fundamentals, it just provides a practice session. It also doesn't sync across devices very well. Using the account on a mobile device does not automatically update the progress of the user on the account when it is accessed via a desktop computer. The immersion program does not give users the ability to collaborate with other users and "lock" translations. Anyone can come in and revise your translation of a sentence. This app is best used by people who already have a basic knowledge of a foreign language. If you don't know the basics, like verb conjugation, syntax and grammar, this app will not provide instruction on these topics, so don't use it until you grasp the basics of the language you want to learn. Keeps the mind sharp. Helps with memory, concentration and of course, language fluency. "I havent really tried any other language learning software etc, but this is really enjoyable and fun"
That its on all platforms - i used to only use it on my ipad but recently have been using more on the computer - it seems theres variation and using the computer makes you learn more. The ipad version seems to have the same sentences etc after a while so you can go by memory and not use the knowledge as good as could be. I also like the amount of languages offered and how its continually growing. Ive "completed" french but will be trying more languages soon. The male voice can be very hard to understand sometimes on the phone app. I also liked when you could verse someone else with the product but that was removed, if that was brought back it would be amazing. especially playing random people of your level. Dont try to do too many languages at once - stick with one and after a while maybe try another similar. Some languages youll pick up easier as they use the same style etc. I work in engineering and i originally started using it as the design plans for a bridge in montreal were in french and english. It made me understand the plans better after a while and look for errors. "Duolingo is a great tool"
Duolingo is free, which is incredible and I recommend it to people all the time. It's a great introduction to a language or a fantastic supplement to taking a language class. Duolingo is great for reading and writing because you need to be able to spell and conjugate words correctly in order to make progress. For being a FREE product there is not much to dislike. I guess the only let down would be that once you complete a language (I've completed Spanish and French) you can keep strengthening your skills but it feels like it's over to some extent and I feel less motivated than I did when I was trying to complete the program. So many people spend a lot of money to learn a language only to get bored and put it down, they end up wasting their money. With Duolingo, it's free, so you can start learning your language and if you decide to discontinue it, you haven't invested money. I would recommend Duolingo to anyone as a great, no money investment language foundation course. I would highly recommend it as a supplement to a foreign language class or audio program. I have used Duolingo so far for personal travel and enjoyment. I will use it for business in the future. I was and still am a big Pimsleur audio program fan but with Pimsleur you never see the words so I think Duolingo is a great supplement to using with an audio program. Fast and fun. An hour of language practice goes by in a flash. The screens are colorful and engaging. Through Duolingo I am learning to write German words and phrases, and I sometimes impress my German boyfriend with a properly pronounced phrase. I am embarrassed being around so many world travelers in his community and I only know one language. Duolingo has given me confidence I can earn a good foundation in German. I use Duolingo in conjunction with other products that require me to speak (Pimsleur), I am shy about speaking German as I am trying to learn it. When I practice with Duolingo, I make sure to repeat words and phrases out loud. I currently don't have internet at home, and would love to download practice lessons to do on my tablet before bedtime or wherever WiFi is spotty. I am using Duolingo to build German language skills to communicate with native German speakers in social situations here in the US. "Duolingo has helped me learn faster and with a better understanding than any other course taken." I really love the flash card style of UI that you use to learn the language. I love the gameification of the app also I play against my girlfriend all the time and its fun. The really best thing I love is how easy it it use and all the reminders it gives to you when you have been slacking off. The way the languages are split up and organized is very easy to follow, you know exactly what course you getting into and what is coming up. The amount of languages on it has been pretty good it seems they keep adding. The one complaint I do have about it that I wish that it would update some of the phrases. I also wish that it would have both styles of languages if there is two styles of the language. Some times you type in the correct phrase and it will still fail out but that happens every once and a blue moon. There is no immersion mode that is in there so you have to go out and speak to people, I don't mind it too much but I can see how others might. Don't expect to learn right away and there is no immersion so you will have to go out and practice with other users or other people. The business problem I was solving was to get in good with my girlfriends parents who speak Portuguese :). The one true benefit beside gaining the ability to speak another language is I feel more confident when speaking with native speakers. "A great way to learn at your own pace"
I like Duolingo because you can use the program when it's convenient; on your smart phone, or a computer. It's self-paced so you can move through the material as quickly as you like. The material is amusing and the interactions keep things motivating. Best of all, it's free to use! I think that teaching strategy is somewhat narrow when it comes to the material. The program progresses through the basics in a linear way. It would be useful to identify the types of words that you wish to focus on. I think it would be great if there was separate learning section that teaches basic phrases useful to know when travelling. If you want to start learning a new language, Duolingo is where you should start. Demonstrating interest and ability in learning a new language has been valuable to me in my current role. It's free and easy to use. It doesn't take long to set up and it's straight forward. You don't have to guess what you're supposed to do. I don't like that more anguished are not offered. I've been teaching adults English and had students use this to continue to practice at home. Some of the students were unable to use it because their language wasn't offered. It's great as long as they have the language you speak and the language you want to learn. It's an easy and free way to practice the basics. Student's don't always have an English speaking person to practice with. This gives them the opportunity to continue working on their skills even when they are not in class. Duolingo is an incredibly easy program that can be used to learn another language. I use this program with my English Language learners as well as my students who are studying French and Spanish. I also use this program myself to work on learning the basics of other languages. You can use it both on the computer and download an app to your smart device. It goes even further than just basic flashcards. You listen and translate phrases and you also are asked to repeat phrases and respond in the new language and it analyzes your pronunciation. The computer versions offers more and you can even 'immerse' yourself by translating things on the internet into the language you are trying to learn. There is not much that I dislike about this program. The log on restrictions make it difficult to use with younger students who may not have the log on requirements. Overall the repetition of words, listening, and speaking really make ti a wonderful program. This is a great program that is easy to use. It has both a computer based program and an app that makes it very versatile and easy to use. It makes learning a new language fun!!! Duolingo is a great free way to work on learning a new language. It is extremely beneficial to our English Language Learners and for our students who are learning another language. "Great introduction to a foreign language"
Fun and easy-to-use introduction to Turkish. I loved how the app looked and how it challenged you to study the language daily. It really helped me understand the Turkish language structure and basic Turkish vocabulary. There is a limit to what you can learn. I wish Duolingo could offer more advanced Turkish language exercises. Or perhaps offer more exercises and scenarios at the levels they currently have. As it is, I have stopped using Duolingo for Turkish because of this limitation. If you want to test the waters of a foreign language, and get a basic idea of how the language works, Duolingo is wonderful. Or if you are rusty and just want a quick brush up, then Duolingo is also a great option for you. I gained mastery over basic Turkish words and phrases, which have helped me navigate daily interactions in Istanbul. I like that the individual lessons are not too intimidating and they incentivize you to complete them by offering rewards. In addition, I like how each lesson builds on the previous one. I dislike that there is no way to build on your vocabulary for individual sections. For instance, I am sure there are more words associated with household items, business, politics, etc, but you are limited to what's in the tree. Keep in mind there will be more vocabulary you need to research on your own. Also, this is a good starting point for becoming fluent but practice makes perfect. Reviewing articles and chatting with users allows you to learn idioms and phrases that true Italians use. I have been able to feel comfortable translating and communicating with Italian individuals. Each exercise in Duolingo has its own crowd-sourced discussion page to which users and highly skilled, in-house native-speaking administrators respond with nuanced answers regarding the grammar points the question covers. I am finding answers to questions and misunderstandings I've had for years about the French language. I've tried just about every method on the market (Pimsleur, Rosetta Stone, Michel Thomas, Living Language,Berlitz, etc.) I find that Duolingo provides a treasure trove of grammatical details that are often breezed over or just skipped in other courseware. The one thing Duolingo doesn't really provide enough of is longer, realistic, conversation practice. . For that exposure, I have found the other methods mentioned useful. Allows me to handle french-speaking client calls more effectively.